Pigment, niezbędny do wykonania zabrudzenia kurzem, błotem czy jasną ziemią. 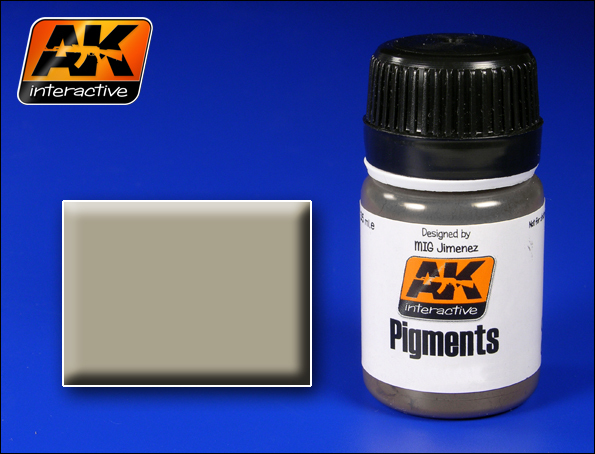 With the knowledge gained by AK Interactive during the long experience of developing the best pigments available for modelling, we have now developed this new basic range of the most essential colours for doing any type of effect. Avoid getting lost in a more extensive range now that the most necessary and useful colours are here. Also, this new range offers pigments that are even finer and that have more exact colours. Pigments are a good medium for any modeller. They can be used ont heir own or in combination with other products. The different colours can be mixed to achieve a greater variety in tone. It’s important to avoid a uniform look on your model and pigments can be used to bring life to your model with very convincing results. Over an enamel base pigments can be used in combination with water or with White Spirit if a protective varnish is applied. Over an acrylic base coat you can best use White Spirit to handle the pigments. Once the pigments have dried the original colour will reappear.